On August 15th, Michaela Bates will marry her sweetheart, Brandon Keilen, at Wallace Memorial Baptist Church in Knoxville, Tennessee. Jana Duggar will be one of eight bridesmaids, one of whom is Michaela's mom, Kelly. Both Jana and Michaela are the second oldest of 19 kids and the oldest of nine (Jana) or ten (Michaela) sisters. And get this! They are only eleven days apart in age. Jana was born on January 12th, 1990, and Michaela on January 23rd. Congratulations to the bates family and to Jana Duggar on being a bridesmaid. Congratulations, Michaela. You will be a beautiful bride and Jana is a sweet choice as a bridesmaid. Many years of blessings. I really appreciate the work that Lili and Ellie do to keep us posted on all these significant milestones. But I am so sad that we aren't able to see these events in detail. TLC and its sponsors made a major mistake on this one. I am very happy for the bates family on their daughters wedding that will be here soon. May God watch over them always. But I really miss 19 kids & counting I hope all is well with them. They are in my prays. Congratulations to Michaela. It's awesome that she's asked her mom and Jana to be part of her wedding party. I'm sure that it will be a beautiful wedding. May God bless this beautiful union of devout Christians. Love that Michaela choose Jana to be a bridesmaid! I hope that we will get to see both families at the wedding. Congratulations Michaela and Brandon. You are going to be a beautiful bride. May God bless the Duggar and Bates families. Enjoy this special day with your special friends! We love the Bates! Congratulations Michaela! Congratulations to Michaela and Brandon! Hope we get to see it. I know she will be a beautiful bride and Jana will be a beautiful bridesmaid. God bless the Bates and the Duggars! Miss you guys! It wasn't TLC. It was the sponsors. Boycott the products. Congratulations and Blessings to Michaela Bates on her upcoming wedding. Jana, you are a beautiful compliment to the wedding party. So happy for you all. YAY! I sure hope we get to see Jana in the wedding! I'm so glad that these updates are being posted! Hope to see the Duggars at Michaela's wedding. Thank you so much for posting these updates! I miss seeing you all every Tuesday night! I hope to catch a glimpse of you all at Michaela's wedding! We are so happy for Brandon and Michaela. They will make a wonderful couple. I wish in my heart of hearts that Jana would find that special someone to love as Michaela has. She is such a wonderful girl and deserves that happiness. I will continue to pray that the Lord will provide her with a soulmate. We love both families. God Bless all of you. Thank you for keeping us up to date with family news. Glad the families are still close. Best wishes to the Happy couple. Have fun you will be beautiful congratulations Michaela! I am so glad to see that the Bates and Duggers are still good friends and did not let the unfortunate circumstances that have arisen hurt their long friendship. I enjoy hearing about both families. Keep up the good work you are doing. That will bean awesome wedding. I think the ring Him Bob gave Michelle for their anniversary sounds really special. CONGRATULATIONS for 31 years. ALL the best to Michaela and her groom! It's nice to know that the people who are close to and love the Duggars are still there for them through the difficult times! We should all be as blessed! Jana you will be as beautiful as always! These are some of the things I miss about 19 kids. Please post pics so we can see another beautiful wedding. You all remain in my prayers! So happy for Michaels & Jana !! God Bless both family's !! jana and michaela seem to have the same sweet spirit...lovely bates show when michaela got engaged!! Nice to see Meredith picture in the blog. At least her eyes are open. Good luck Jana in the Bates wedding. Gratz to the happy couple and I am so pleased Jana will be part of that special day. Two beautiful and special girls. Wishing all the best to sweet couple. 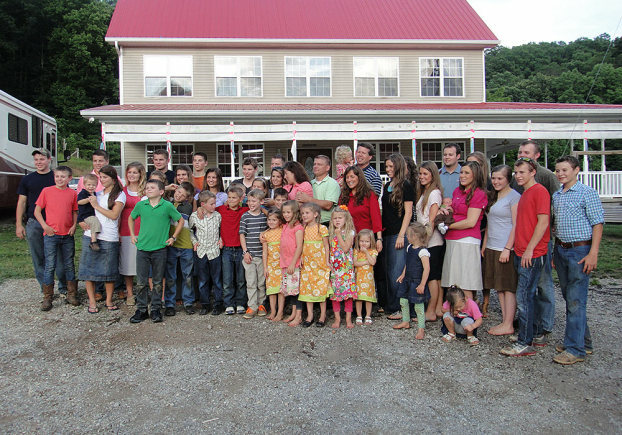 Duggar Show, you are a very beautiful family and both you and the Duggars are missed so much by many including me!!! I pray GOD will help bring them back so many others can receive your messages, and learn by your examples!!! GOD BLESS YOU BOTH AND BOTH YOUR FAMILIES!!! All the best for the future hope ur day goes really well. I SO want the beautiful Janna to find a great husband !!! Precious person. Many blessings Michaela and Brandon on your wedding! I think its adorable that Jana and Michaela have so much in common. What a lovely friendship! Good thing the public seems to genuinely like Jana. Otherwise posting the date and place of the wedding could be bad. I could totally see people protesting and ruining the bride's day. I met some of the Duggars when they were on the campaign trail last year in Woodstock Ga, and when I met Jana see said "hey what's your name" and I told her my name is Jennifer. She told me I fit in perfectly. We didn't have much time to talk but we have a lot in common. We are both fraternal twins, and our birthdays are only a day apart! Maybe you can share the bouquet after one of you catch it Jana and Michaela! You girls just might be the next brides!! Blessings to the new couple. So glad the Duggars have wonderful friends standing by their sides. Blessing to the Duggars, too! Thank you for adding Meredith's picture to the front page. So cute! Love both families! I'm so glad that Michaela got the church she wanted. It will be a beautiful wedding, with a beautiful bride and groom and wedding party! Can't wait to see the wedding. Congratulations Michaela . Hope you have many years of wedded bliss . That's very sweet that your mother is one of your bridesmaids . And I also happy that you also asked Jana to be one . Keep us updated . The pink church! Last time I was there, every single thing that could be pink, was. Walls, chairs, carpet, flowers. It is a large church, so if you are going to have all your family members there and all of your family friends, I guess that's one place to have it! Jana you will make a beautiful bridesmaid. I support the Duggar family. I wish they got back on tv. I love seen a Christian family on tv. We need more Duggars family rather than Kardashian family. I'm hoping Jana will meet a nice young man at the wedding! Congratulations Michaela! Love both of these families! I am so happy Jana is going to be in Michaela & Brandon's wedding. Hope to see all the Bates and Duggers at the wedding!!! Congratulations! And, I agree with Anonymous ....73, Jana needs to be introduced to one of the many friends of Brandon's at the wedding. Beautiful girls! Jana is a bridesmaid. I had read she was engaged. Is she ?! I hope TCL will get smart and bring back 19 Kids and Counting before her wedding day. Before Josiah marries and before there is another engagement . Viewers are getting impatient.